Gamers have accumulated a combined Gamerscore of over 270 billion on Xbox Live. Oh, they grow up so fast! 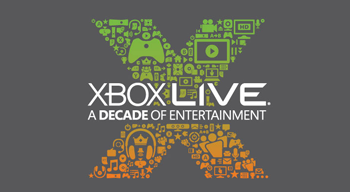 Xbox Live turns ten years old today, and Microsoft is celebrating with some gifts for gamers. Today and tomorrow, the recent Summer of Arcade Kinect title Wreckateer will be available for the low, low price of free. You can also get a chance to win a very limited edition Xbox 360 console by downloading a special 10th anniversary gamer pic. There are even more Xbox Live deals to be had over the next few days as the birthday party continues. If you missed out on Xbox Live Arcade fan favorites Castle Crashers, Battlefield 1943, Fruit Ninja Kinect, Geometry Wars: Retro Evolved, Bastion, Peggle, or Full House Poker, now's the time to buy. These games are all 50% off until November 22. Xbox Live made its way to the original Xbox a year after Microsoft's first console launched, and it's come a long way since then. According to Xbox Live Corporate Vice President Marc Whitten, "14.5 billion Achievements have been unlocked worldwide" on the service, "accumulating a total combined Gamerscore of more than 270 billion." In 2012, an average of 9.4 million gamers enjoyed online multiplayer on Xbox Live every week. The free and discounted games are on sale now, so feel free to get downloading.